Here's a superb new online slots game. See more great games here: SlotsBaby. Formed in 2010, Push Gaming is still something of a newcomer to the online casino industry. Their first licenced game wasn’t released until 2012 – but they haven’t looked back since. With beautifully designed games such as Peter and the Lost Boys, Meet the Meerkats and Ultimate Dream Team, Push Gaming has gained plenty of attention and fans of their colourful approach to online gaming. The game has five reels and 25 paylines. There is an autoplay feature which allows you to spin the reels for a selected number of times without stopping. All your winnings are automatically added to your total as the slot auto-spins. There are a lot of different symbols – ten, in total. These symbols can be split evenly into two groups. Five of these symbols are the card symbols. They start from the number 10 and go all the way up to the Ace card. The payouts for these card symbols are fairly low but they appear on the reels more frequently because of that. The next set of five symbols are the character symbols. These symbols appear on the reels much less frequently and therefore mean they bring much bigger payouts with them. The characters include the King and Queen, a knight, his horse and a maid. A winning combination involving these characters will result in a jackpot win so keep your eyes peeled for them! There are also a few extra symbols to put the cat amongst the pigeons and keep you interested. The flag symbol is the game’s Wild. The flag can take the place of any of the other symbols in the game and it can also activate re-spins which move all other symbols by one position. Humpty Dumpty can also be found as a symbol on the middle reel. 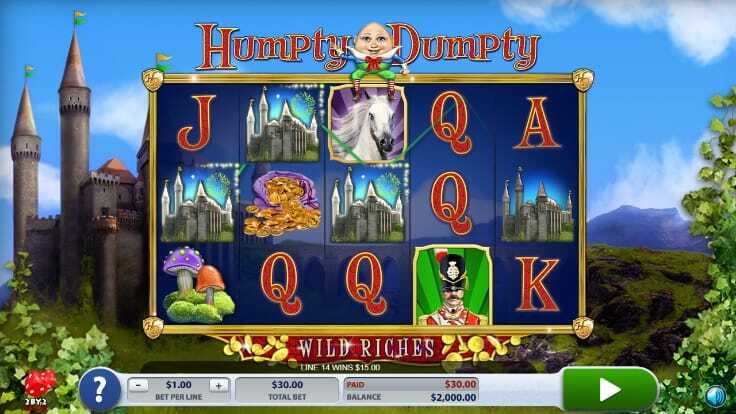 If you find Humpty Dumpty, you’ll be rewarded with an extra six free spins. It’s definitely a new take on the classic nursery rhyme. As usual from Push Gaming, it’s nice to look at as well as a unique and fresh idea. The game is so simple to play, which is also a large part of its appeal. You can spend hours on this online slot game without having to do too much work or thinking too hard at the same time. Just sit back and enjoy.